This is a partial map of the 11,616 WikiLeaks Iraq SIGACT ("significant action") reports from December 2006, the bloodiest month of the war. Each report is a dot. Each dot is labelled by the three most "characteristic" words in that report. Documents that are "similar" have edges drawn between them. The location of the dot is abstract and not based on geography. Instead, dots with edges between them are pulled closer together. 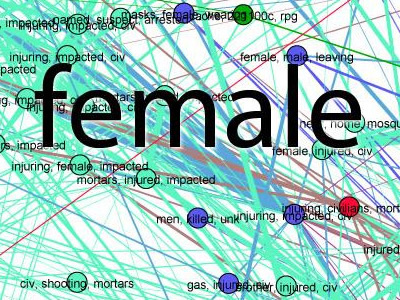 This produces a series of clusters, which are labelled by the words that are most "characteristic" of the reports in that cluster. 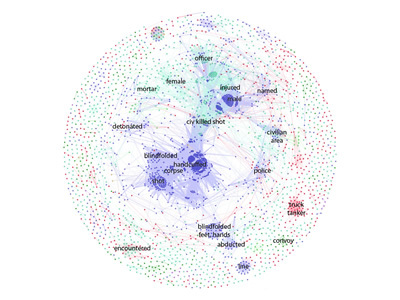 It's mapping 3,051 nodes (26.3% of 11,616 documents), connected by 106,660 edges, and 17,608 terms. The highest incidence (44,61%) relates to criminal events, with enemy action (29.47%) and explosive hazard (16.72%) following behind.